Congress required President Bush to submit an initial report to lawmakers assessing whether the Iraqi government has made satisfactory progress toward achieving the benchmarks set for it. Read an assessment of progress described in the Bush administration's report. The White House has delivered a much-awaited, interim report card on President Bush's troop surge strategy. The 25-page assessment gave mixed reviews. In some areas, mostly security, the Bush administration said Iraq made progress, but the political situation is still far from adequate. The report comes as several Republicans have broken ranks with the President and are calling for a change of strategy in Iraq. Two months ago, when Congress passed a supplemental war spending bill, it ordered the White House to provide a progress report by July 15. Back then, the report was seen as an initial check on whether the U.S. military surge was reducing violence enough to create conditions for political progress. But as calls are growing from both sides of the aisle to pull out of Iraq, the assessment has taken on greater political weight. On Thursday, President Bush tried to play down the report, saying it was just a preliminary assessment. "Of the 18 benchmarks Congress asked us to measure, we can report that satisfactory progress is being made in eight areas," the president said. As an example, President Bush pointed out the Iraqi government is spending more than $7 billion of its own money this year to train, equip and modernize its forces. "In eight other areas, the Iraqis have much more work to do," President Bush said. "For example, they have not done enough to prepare for local elections or pass a law to share oil revenues. And in two remaining areas, progress was too mixed to be characterized one way or the other." Analysts say the measurements used to gauge the benchmarks — a simple satisfactory or unsatisfactory grade — are too vague. In fact, for some benchmarks deemed satisfactory there were warnings that more improvement was needed, or that progress was being made only with substantial assistance from U.S. forces. Ilan Goldenberg, executive director at the National Security Network, said some of the benchmarks are superficial, such as, one that called for establishing a constitutional review committee. That got a satisfactory mark, but that does not mean there has been any real progress towards hammering out a constitution in Iraq, Goldenberg said. "Yes, they've created a committee, but the committee has asked for numerous extensions. Even though they've had numerous meetings, they've actually, specifically agreed to table some of the most complicated issues and leave them out," he said. The report said that the Iraq government did provide three, trained-and-ready Iraqi brigades to help with the Baghdad operations. But Goldenberg said now they are not fully manned, and there are ongoing concerns that Iraqi troops are not always loyal to the Baghdad government. The progress report indicates that the government has not been able to control militias and that sectarian violence is still rampant. That violence is hampering any efforts at political reconciliation, said Andrew Krepinevich, with the Center for Strategic and Budgetary Assessments. He said it was unrealistic to think many of the political benchmarks could be reached this quickly because, historically, power in Iraq means seizing it, and holding on to it by any means. "And, so, after decades and decades and decades of this, the notion that the Kurds, the Sunni Arabs, the Shia Arabs can sit down and work out some sort of compromise American style is really a very difficult proposition for them to undertake," Krepinevich said. President Bush described political progress in Iraq as a "lagging" indicator, meaning it will likely only be achieved after the U.S. military surge is well underway. But Michael O'Hanlon, a senior fellow with the Brookings Institution, said the lack of political progress is more serious than the report suggests. "This is not really a lagging indicator. It should be a leading indicator because you need progress on a few issues like sharing oil before you can expect to see reconciliation or a lowering of tension," O'Hanlon said. But there has been little forward movement to push through an oil sharing law, or any legislation to bring former Baathists back into the fold. Some political parties are boycotting parliament, and members of government are refusing to sit down and discuss issues. Michael Rubin, with the American Enterprise Institute, said there is no real impetus for the various factions to come together, especially if the U.S. commitment to Iraq is shaky. "If they thought the Americans would be there for 20 years, they might be sitting down and negotiating right now. If they thing the Americans aren't going to be a player in Iraq next year, there's absolutely no incentive to pay attention," Rubin said. President Bush predicted that those who want to pull out of Iraq will point to the unsatisfactory report card, but he reiterated that this was a preliminary report and that a more comprehensive assessment would come in mid-September. 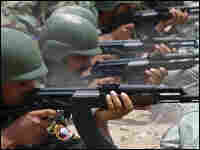 Iraqi police cadets train at a firing range in a training base in the Iraqi town of Hilla, central Iraq, on July 9, 2007. President Bush's pleas for patience on Iraq were rebuffed by House Democrats, who voted along party lines to approve a troop-withdrawal measure. The vote came after a White House report found limited progress toward Iraqi government benchmarks. Earlier Thursday, the president defended progress in Iraq and pleaded for more time as the White House issued a report acknowledging that the Baghdad government has failed to meet many of the benchmarks laid down by Congress. 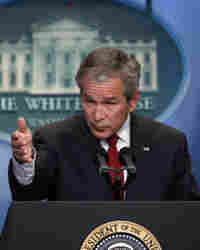 "We can report that satisfactory progress is being made in eight areas," Mr. Bush told reporters at the White House. 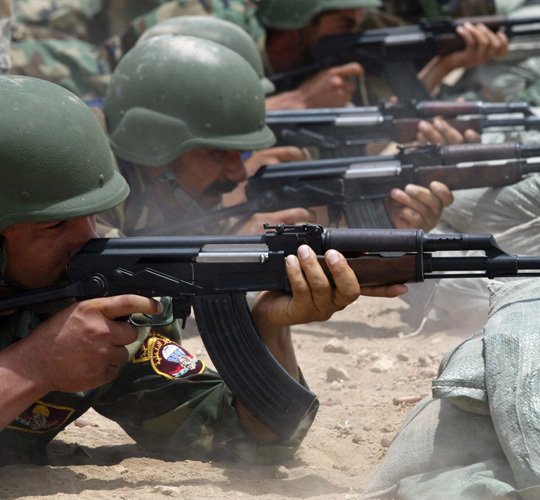 "In eight other areas, the Iraqis have much more work to do." The House withdrawal measure, which passed by a vote of 223-201, would require U.S. forces to be out of Iraq by next April. It prompted some highly charged partisan debate. Georgia Republican Tom Price said the bill was nothing but political pandering by Democrats. "Clearly, this bill was not written in response to what our generals think, whose interim report was released just hours ago," Price said. "Instead, it was written in reaction to polls and to pressure from moveon.org. And others." But Georgia Democrat John Lewis said the measure was a step that would, as he put it, "end the madness in Iraq." "How many more of our young people must die before we realize enough is enough," Lewis said. "One more day, our involvement — it's too many. One more death is one too many. This war is not worthy of another drop of human blood." The Senate is expected to vote next week on a similar measure, but it is unlikely to survive. And if it were to reach the White House, it faces a certain veto by the president. Mr. Bush said the newly released report had been completed less than a month after the final reinforcements in the so-called troop surge had arrived in country. He said he understood that Americans were experiencing fatigue over an "ugly war," but that the course in Iraq needed to play out. "The Iraqis do not want U.S. troops patrolling their cities forever, any more than the American people do," he said. Bush said he would withdraw troops when the time is right, "not because pollsters say it will be good politics." Overall, the much-anticipated White House report on Iraq found that the U.S.-backed government in Baghdad has not achieved any of the major goals considered necessary to quelling sectarian violence in the region, such as passing legislation to divide the nation's oil revenues. While the president was fielding questions at a White House news conference, Senate Majority Leader Harry Reid (D-NV) issued a statement saying the president needs to admit that his "Iraq policy has failed." "It is time for the president to listen to the American people and do what is necessary to protect this nation," he said. The White House assessment also comes as GOP support for the Bush policy in Iraq is in jeopardy, with Sens. Richard Lugar (R-IN), Pete Domenici (R-NM) and several other Republicans saying they want the president to begin reducing the U.S. military role in Iraq. But House Republican leader John Boehner of Ohio, standing firm with the president, called the Senate defectors "wimps" on Wednesday in a private meeting with rank-and-file Republicans. Shoring up GOP support has become critical for the White House as public opinion polls chart ever-deepening opposition to the war and a climbing U.S. casualty count 16 months before the 2008 elections. Democrats say the findings in the report are proof the war effort is failing, while most Republicans say the limited progress shows hope and that lawmakers should not lose faith. Boehner "wimps" remark ironically came at nearly the same moment that several GOP senators beseeched the White House without apparent success for a quick change in course on Iraq. "I'm hopeful they (White House officials) change their minds," Sen. Domenici said after a meeting that Mr. Bush's national security adviser, Stephen Hadley, held with several Republicans in the Capitol. Domenici and several other GOP members, including Sen. George Voinovich of Ohio, say they want Bush to begin reducing the military's role in Iraq. In the meeting, Hadley said Bush wants to wait until September when Gen. David Petraeus, the Iraq war commander, will reassess military progress. Emboldened by the Republican divide, Democrats called for a vote on legislation to end U.S. combat operations next year. The House planned to vote first on Thursday. Petraeus plan to work, and that too much is at stake for Congress to renege on its commitment now by approving what can only be described as another partisan stunt by Democrats."